Adapted from Gregory Maguire's 1995 novel Wicked: The Life and Times of the Wicked Witch of the West, Wicked is the smash-hit musical that delves into the background of the infamous Wicked Witch of the West. Telling the story of The Wizard of Oz from the point of view of the two witches, Wicked has become one of the world's most successful musicals. Wicked follows Elphaba, who is unfortunately very green, as she begins school. Upon meeting Galinda, the pair begin a journey that leads them to their titles of the Good Witch of the North and the Wicked Witch of the West. With music by Stephen Schwartz and book by Winnie Holzman, Wicked has featured stars such as Kerry Ellis, Idina Menzel, Rachel Tucker and Willemijn Verkaik amongst many others. The Apollo Victoria’s box office is located within the theatre building and is open Monday to Saturday from 10.00am to 7.45pm If you have opted for ticket collection then you can pick up your tickets from the box office on the day of the performance at any time before the show. To collect the tickets you must be the cardholder and you will be required to sign for the tickets. Built in 1929, the Apollo Victoria Theatre is one of London's most modern theatres. Located just outside Victoria station, away from the main hub of the West End, the venue was originally designed as a cinema before becoming a theatre after the Second World War. Initial years saw the Apollo Victoria host concerts, ballets and films before musical theatre came in in the 1980's. Notable productions at the Apollo Victoria Theatre include The Sound of Music (1981-1982), Camelot (1982-1983) and Fiddler on the Roof (1983). In 1984, Andrew Lloyd Webber's innovative musical Starlight Express captured the hearts of audience, running for an impressive 18 years until 2002. Throughout this period of the time, the theatre had race tracks winding throughout the auditorium for actors to skate across. After the success of Starlight Express, the theatre hosted short running musicals such as Don Black, Meera Syal and A.R. Rahman's Bombay Dreams (2002-2004), Saturday Night Fever (2004-2006) and Movin' Out (2006). In 2006, the hugely anticipated Broadway transfer of hit musical Wicked came to the theatre, starring Kerry Ellis in the title role (after original Elphaba, Idina Menzel). Despite its huge success with audiences, the show didn't win any Olivier Awards until 2010, when it won the "Most Popular Show" audience award. 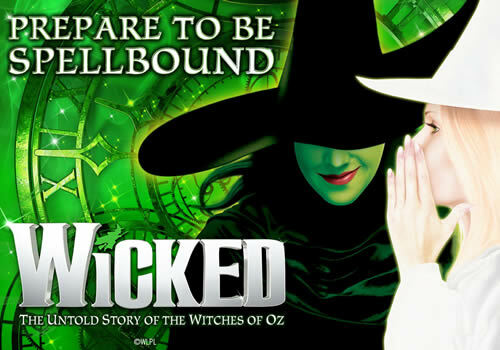 Wicked is one of the highest-grossing pieces of West End Theatre of the last decade. The show is currently in its 12th years and continues to pack out audiences each day, and stars famous faces such as Rachel Tucker, Louise Dearman and Willemijn Verkaik.